Alright … our SUPER nice contact at the Hampton Inn and Suites in Trophy Club has offered us a kindness. Whereas, up until Feb. 12, you could click on the picture of the hotel and be linked directly to a special rate we worked out with them, that link has expired. HOWEVER, Vickie is STILL willing to give you the special rate — you just need to call her directly on her cell phone number and she will take care of you. That phone number is: 817-366-1731. Just explain you are calling to reserve a room for The HOT. She will know what you are talking about. Any issues? Just call me, Rebecca, at 512-789-4118 or 512-413-5919. 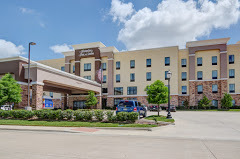 For those staying at the Hampton Inn & Suites in Trophy Club, check out this route to and from the shop if you want to ride out from the hotel and get some extra miles in! OH YAY! I have reserved our “Hotties” a block of rooms in Trophy Club, about 20 mins from our HOT headquarters in Keller. Click on the photo to go to a direct link where you will be able to make a room reservation at our special price. You will also be able to see the rooms, tour the hotel, get directions, etc. etc. We have blocked 30 rooms total, we will use a few for our sponsor reps, so don’t wait too long to decide. There are rooms with 2 queens and king bed suites. Mike toured the hotel and our rep there is enthusiastic about having our group. I also checked with the hotel about whether there would be any problem with our guests storing their trikes in their rooms. No problem! I think you will be pleased. The hotel includes a substantial breakfast, free WiFi, and many other amenities as well. The hotel does not have its own restaurant, however right across the street is a bar/restaurant called Breadwinners. Perhaps we will see you there on Friday evening. AND … if you are wishing to stay in your RV, there are a couple of RV parks near the hotel. 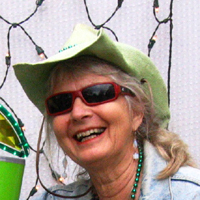 One of our guests seemed pleased with The Vineyards Campgrounds on Lake Grapevine. It looks to be about 20 minutes away from The Hampton. Our contact at The Hampton also mentioned the Northlake Village RV Park in Roanoke which looks as if it is about 10 minutes away from The Hampton. 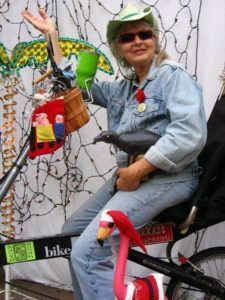 If you are an RV’er and wish for fellow RV’ers who are attending the HOT to stay in the same park, I would encourage you to post a comment on this page. ALRIGHT, I can cross one more thing off my HOT “To-Do” list. YAY! It may be just about time to get in the Xmas spirit. Register for the HOT by 12/26 and get a special offer! 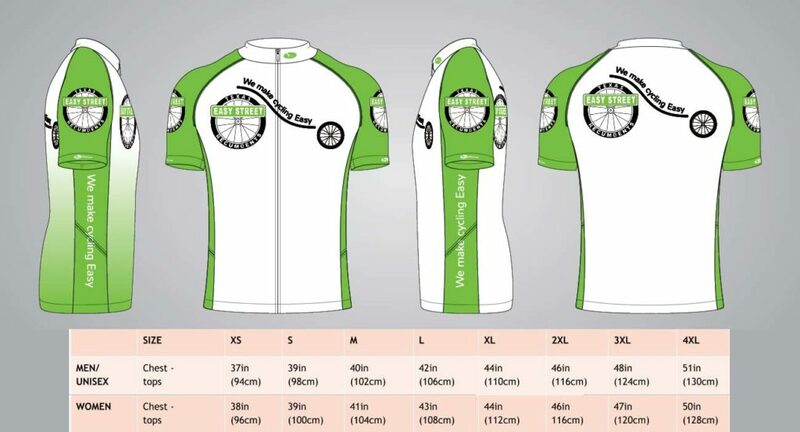 What you will get is a REALLY GOOD DEAL on our new Easy Street “Texas” jersey, designed especially for recumbent riders. It is the same jersey as we have sold in the past (and have since run out of), but we have changed “Austin” to “Texas” in honor of our two shops. Oops! We need to have a few days to organize our order and submit it to Bend-It. So, I had to change the final date to register and order jerseys to Dec. 26th. Thanks for your understanding! The jerseys are going to retail for $65/each. WHEN you register by December 26th, you are able to order a jersey for only $45, deliverable to you at the HOT. In this way, you can get a significant price break on them AND be sure you get one (or as many as you want) in the size(s) you want. Now, a word on sizes. Bend-It swears that if you use their size chart, you will get a jersey that fits. I know we all feel as if their jerseys run small. So, keep that in mind when you order. 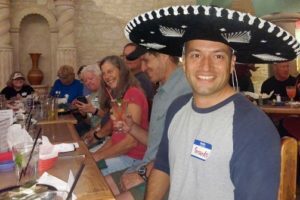 Austin Area: Community Ride – Sat., Aug. 4th, 7:00 a.m.! So, come ride with us! It’s been way too long since we have had an Easy Street community ride so now it’s time. Bring your friends and family, no matter what they ride, and join us for a lovely early-morning ride down the South Walnut Creek Trail and back. It is mostly shady and … it’s an “out and back,” so if you get tired, you can just turn around and head back the way we came. Plus, we leave nobody behind. There will be a sweep who will accompany you back to the starting point if you decide that’s what you want to do. In honor of our friends from the Pflugeride Social Riding Group who we hope will join us, we are starting at the north end of this trail. This means the Austin Tennis Center, 7800 Johnny Morris Rd., Austin, TX 78724. The ride is approximately 7.3 miles south to Govalle Park, and then we get to use the rest room, drink water, rest, chat (now that we have woken up), and turn around and head back. It is mostly shady and is a nice wide paved trail wandering through trees and grassland. This ride is purely a social ride. It will be wheels down at 7:00 a.m. in order to beat the heat. Bring water, sunscreen, snacks, whatever you need! Wear a helmet! Spread the word … we would love to meet more folks. If you have questions for Mike, he will be there to answer them. If you have questions about this event, call Rebecca @ 512-789-4118. If the weather is questionable, either look on Facebook for an announcement or call that cell phone number just listed. Hope to see you there! All I can say is … we could not have asked for a better inaugural Glamping event! In fact, when I questioned one of our Glampers on Sat. evening if she and her husband had been having fun, she replied, “Oh, this is way beyond fun!” That sure made me happy. 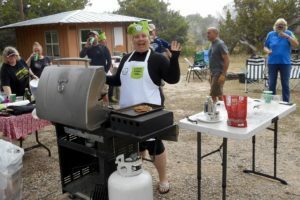 And, whether or not you choose to read the rest of this blog post, make sure you get guest perspectives by taking a look on Facebook and reading Gay Bradford’s visitor post, comments posted by various other glampers, and looking through the album of photos. With this being our very first “Glamping” (“Glamor” + “Camping” for the uninitiated) adventure that Easy Street has ever hosted, needless to say, we were on pins and needles from the very start. Would there be enough people to sign up? Did we choose the right location? Had we planned the right number of activities? etc. etc. And, of course, the first weekend of November was pushing it in terms of what we could expect weather-wise, but I simply could not resist the idea of scheduling it to coincide with the full moon. And, it all worked … Thank the Lord and pass the mashed potatoes! 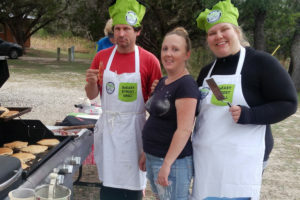 Kerrville-Schreiner Park in Kerrville, TX was just a great place for our first such event. 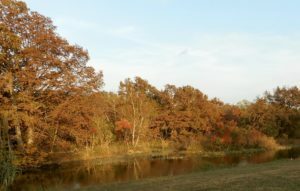 The setting was beautiful and we were lucky enough to have the fall color just beginning to show up. 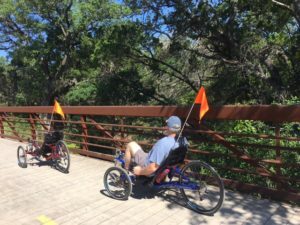 The paved roadways in the Park, along with the beautiful 4-mile paved trail along the Guadalupe River connecting the Park and Kerrville, gave those who were not interested in off-road biking plenty of opportunity to ride anyway. And, Sunday morning a small group of intrepid adventurers rode a lovely country road out on the north side of town. Though they missed our fabulous flapjacks, sounds like they enjoyed themselves immensely. The ride into Kerrville for dinner at Mamacita‘s on Friday evening was a great way to start the weekend, especially on the way back under that full moon I mentioned. I was a little disappointed we did not get a private room for the sake of making announcements and going over some riding tips for the next day, but the restaurant was all set up for us and, despite our large group, the service was excellent, the food was very good, generously portioned, and reasonably priced, and the restaurant provided quite a lively and entertaining setting. And — they helped us celebrate Fernando’s birthday which was important! Riding at night was a new experience for some, but with lights, the full moon, and great company with everyone watching out for each other, it was lovely. And, there was a fountain display with rotating colored lights which we would never even have noticed during the day. I have to mention here the hospitality of Adam and Lisa, owners of Hill Country Bicycle Works, locations in Kerrville and Fredericksburg. They allowed us to stuff all of our ‘bents into their shop while we dined at Mamacita’s. (There was no safe bike parking at the restaurant.) And, they made friendly and interesting companions at dinner as well. 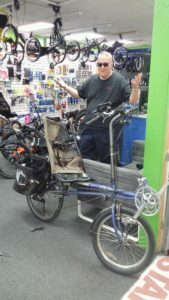 In fact, a fellow had wandered into the Hill Country Bicycle Works earlier on Friday looking for recumbents. They encouraged him to come back in the evening with the promise that there was going to be a bunch of us showing up … and he did, along with his wife. They had a great time, he bought a used ‘bent Mike had brought along, he provided an internet connection to Mike on Sunday for his appearance on the Laidback Bike Report, and, on top of all that, he turned out to be a fellow model rocket enthusiast so he and Mike talked model rockets as well. I love to experience serendipity! 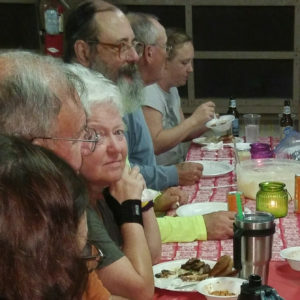 Easy Street provided breakfast Saturday and Sunday, lunch-fixings on Saturday, and the main course for a potluck dinner Saturday night. There was PLENTY OF FOOD. I will have to admit that buying food for group meals is challenging. With the word “glamor” involved as part of our promised experience, I simply could not stand the idea of running out of food — and we certainly did not! 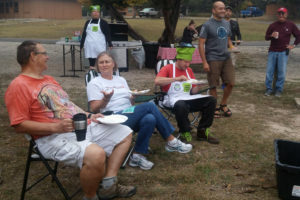 And, turns out our glampers were gifted cooks as well; sure enjoyed tasting the various dishes they contributed. There were many pleasures to the weekend, planned and unplanned, from “Okie Golf” [you can ask me later!] provided by the Bradford’s to free massages by Fernando who set up Saturday afternoon in the Dining Room. There were experienced riders helping inexperienced riders. There were new friends made, future outings planned, and everyone pitching in to help as needed. THANKS EVERYONE! We will do it again. Cheers! 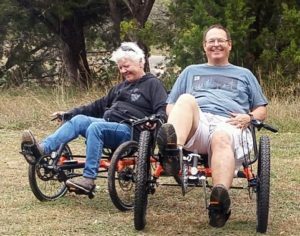 After a lot of hand-wringing and brow-knitting I’ve decided to not do the Heart of Texas Recumbent Rally in 2018. I’ve several reasons for this. We’ve been doing them steadily for 7 years now, and even a good thing requires a breather. This gives us more time think up fresh ideas for it. Also, I’ve got Rebecca working on a busy events calendar for the winter and into spring. I haven’t had this level of support in planning events before and it is nice to see my calendar filled like it is, but it does no good to overload her. This new “Glamping” idea is one I’d like to put through the paces. Lastly, I’ve got some big projects that I need to focus on for the shop’s overall benefit, so I’m putting aside this annual rally project for this year. Enough dithering on the matter. Ain’t gonna be no HOT for 2018, so there. Apologies to all who were looking forward to it. Stay tuned for fun, trikey events coming from ESR, where We Make Cycling Sneezy, or something like that. Glamping under a Full Moon! 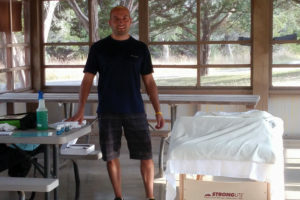 The Vision: See Mike’s article on “Glamping” here. We want to make Mike’s vision happen. You KNOW how he likes to throw a party! 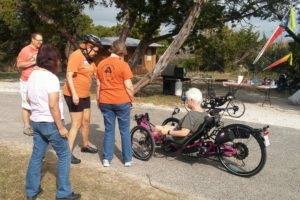 And, we are hoping a group of our friendly recumbent riders (families, friends, upright riders are all welcome) will join us for a weekend of fun that includes socializing, eating, riding, and … well, we’re working on other stuff!. RV sites according to your preferences. They have Full Hookups (50/30 amps), Full Hookups (30 amps), and sites with water and electric, no sewer. Reservations are very reasonably-priced and, if you cancel at least 48 hrs in advance, the cancellation fee is only $20. Check-in time for the Mini-Cabins is 3:00 p.m. For everyplace else it is noon. * Afternoon: Arrive and get settled. * Morning: Meet up for a breakfast prepared by Easy Street. Get ourselves organized for the day. 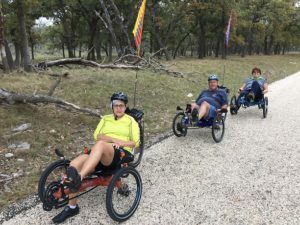 The more adventuresome will head out to discover the unpaved trails within the Park; off-roading on a recumbent–exciting! * approx. Noon: Sandwich fixins will be available for lunch. Those who are going on the Winery Tour probably want to clean up and get ready. Exact pick-up time is not yet decided. Those who are not choosing that option can get together and decide what they want to do individually or with each other. And, if the Winery Tour does not appeal, further exploration of the Park, shopping in Kerrville, playing on the Guadalupe River, are all possibilities and we will provide a more complete list of suggestions as well. If kayaking on the River appeals to you, I would make those arrangements in advance by calling Paddle Kerrville. Evening: We all join up and gather ’round the Easy Street grill for burgers, weenies, the ‘fixins, and drinks. We would ask you folks to bring potluck dishes to share, e.g. salads, beans, casseroles, vegies, desserts. (The Dining Hall only has a couple of microwaves (no stove or oven), so keep that in mind. We can also manage some space on the grill if needed.) Easy Street will not be providing any alcohol, so plan accordingly! We are thinking we will all have stories to tell about our day’s adventures and what better way to do that than around dinner followed by a campfire. If there is interest in a Tech Clinic by Mike, we can do that this evening or maybe Sunday morning after breakfast. * Wake up to another Easy Street breakfast. Visit. There may be something you wanted to see or do that you did not yet get to. We might squeeze in another organized ride, we’ll see. Check-out time is noon. We are open to other ideas you might have about things to do. Just share them with us. There are a couple of promotional events coming up and … if you’d like to come join us, socialize, show off your ‘bent and talk to the uninitiated about how great they are, we would love to have you. Sun City Vendor Fair: Friday, Sept. 15, 9:00 a.m. – 2:00 p.m. This is a fun event where vendors who have products and services to offer the Sun City Community show up and strut their stuff. And, historically, it has been good for the shop. And, it is really useful to have Easy Street customers show up. The address is: 2 Texas Dr., Georgetown, TX 78633. Click on this link for map and directions: Sun City, Georgetown. Come join us (and a bunch of other people!) to Ride with the Mayor of North Richland Hills. 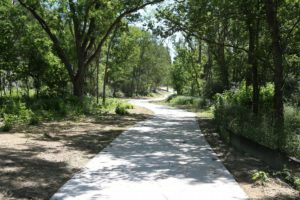 When: Tuesday, September 5, 6:30 p.m.
Where: This ride leaves from Cross Timbers Park, 7680 Douglas Lane. Micah has been regularly showing up at this ride. However, this time Mike and Rebecca will join him. Look for the Easy Street van. We will be there at least by 6 and are looking forward to joining in this fun. Oh, and there is something on the website about this being a “Healthy Heart Ride, Wear Red.” So, let’s support them in that too.